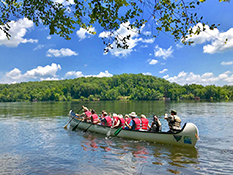 Last year, North Carolina State Parks acquired two "big canoes" to help park visitors experience our natural resources. Funded by the Friends of State Parks, these canoes can each accommodate 12 people for guided paddling programs! Find an event below to sign up for this unique learning adventure. Big Canoes are for school groups, too! Teachers — want to take your class out on the big canoes for an unforgettable science lesson? Join us for a fun filled day at the Carolina Beach State Park Marina. There will be classic boats on display, safety demonstrations, vessel safety checks, boating information and the Underwater Archaeology will be on site with displays and information. There will also be kayaks and paddle boards and much, much, more. Food truck vendors will be on site for lots of food and refreshments. A free day of fun, food, games and activities for active duty and retired military members and thier families!